Summer brought her little pup, Betty, to Thanksgiving. 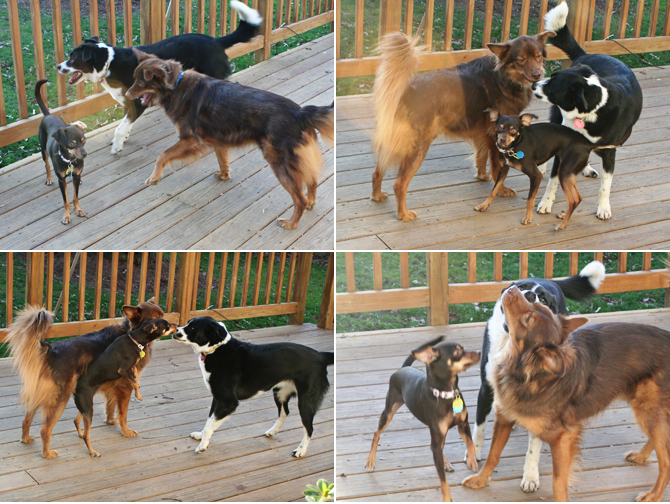 Copper and Belle and Betty are real funny together. Betty is afraid of people, but not of her bigger buddies. She plays and chases them and they have a grand old time. Yum. Dog hair is so tasty. We are quite thankful for Summer, even though she got left off the previous collage. 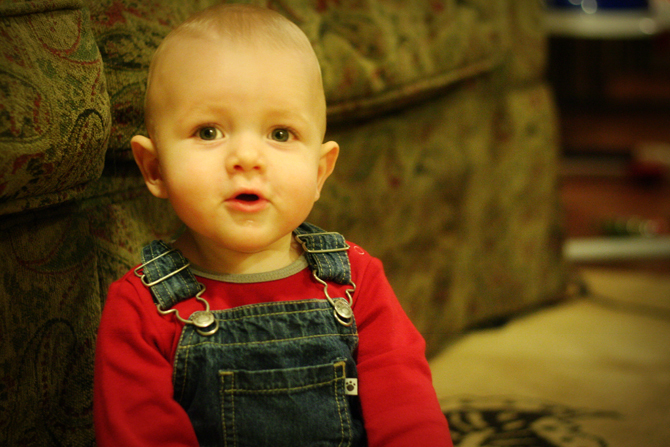 Strangely, Finn is wearing the same onesie as he was last time he saw Summer. Promise, I do change his clothes. 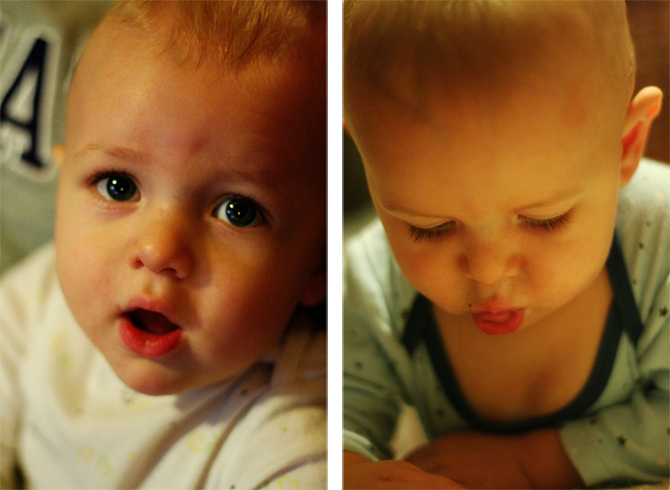 Aunt Lilias took some pictures of Summer today so that we can prove that she loves Finley in a few years. Because if we don't have a picture of it, then it didn't happen. Summer is currently working on a series of tattoos from her favorite childhood book, King Bidgood is in the Bathtub, on her arm. She got the book when she was 4 and loved the story of the stubborn king who wouldn't get out of the bathtub. As she and Lili experienced tonight, sometimes King Finley doesn't want to get out of his tub either. We're so thankful for family who loves our baby and never tires of kissing him and tickling him and scooting on the floor with him. Also thankful for: Summer and Copper. Both are apparently camera shy. I saw "New Moon" (which I keep calling "the Twilight movie" and get SCOLDED by 13 year old girls). And I switched my allegiance. Sorry, Edward. I'm Team Jacob now. As one of my 8th grade girls said, "I'm Team Edward in the books, but Team Jacob in the movie. Did you see Edward with his shirt off? Gross." Out of a random sample of my 8th graders, everyone was Team Jacob. Surprising. And then I realized that Taylor Lautner (who plays Jacob) is pretty much 11. And then I realized that I really like younger men. I know this is the same picture as the previous post, just before Kanye showed up. It is far and away my favorite picture of this kid. I take like 100 pictures a day, so I was bound to get a winner some time. Happy Thanksgiving and birthday tomorrow, Courtney! Why, thank you, Kanye. I totally agree. There are around 3.5 teeth in his little mouth. He sleeps much better, I'm done feeding him in the middle of the night! In turn, he eats better as well. We're working on solid foods and I'm having fun making them for him. He scoots well now, and he does it in his own special way. Even though he doesn't wear his brace when he's scooting, he doesn't push off of that leg. That makes him kinda go diagonal and use one hand and the other elbow to move around. It's cute. Bath time is his favorite--he strongly protests when it's over. He loves to stick all the bath toys in his mouth and try to escape from the tub. He is just about always chewing on his tongue or lip. It's hard to get a normal picture of him. Arching his back and throwing his large baby head around is his way to get you to let him down to play with his toys. When he's playing, he makes cute squeaky soft noises like a little mouse. You'll tell me if you get sick of pictures, right? In case you haven't clicked over lately... I changed the design of the blog. I'm beginning to develop an unhealthy love of photoshop and really enjoy designing headers. We've designed several blogs lately for FREE and are starting to see if we can get people to give us money in exchange for our services. Money or baked goods. Or Vera Bradley. Or come visit us. There are a myriad of ways we can be reimbursed. So if you have a blog, or might be starting one, or know someone with an ugly blog... let us know and we will shine the light of blog beauty on them. Email rvblogdesigns @ gmail . com and we will get back to you faster than you can imagine. 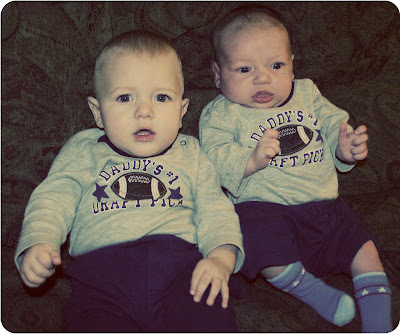 Calvin and Finley: forced destined to be best friends for life. Even though Calvin has NO idea what is going on in this picture and all Mr. Finley wanted was to arch his back and be picked up--they'll love each other soon enough. How cute are the matching onesies? Thanks, Victoria! 2 points for anyone who can name the catchy theme song used as the title. Finley got to have lots of babysitters over the past 5 weeks. We really missed Amy--but were glad she had some good time to get to know Calvin before she gets to handle TWO babies every day! Sol's sister Summer came and cooked us gourmet meals, taught me all about cooking reality shows and began to read Finley the children's book that she is having tattooed on her arm. And she wore this shirt that kind of looks like it should be a onesie. 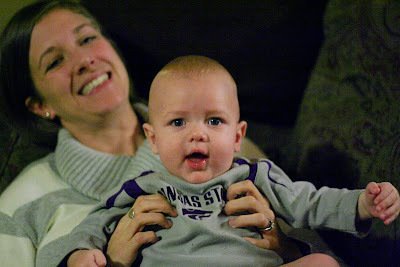 My sis, Laura, had a week break from med school and got to come watch the little dude for a week too. She got to experience the scooting and pooping and is the reigning champion of getting milk into my child. 8.5 ounces in one day! Go Laura and Finley! We're so happy that Amy is back, and that Finley is beginning to forge a lifelong friendship with Calvin. Finley likes to sing along with Calvin's cries, and is teaching Calvin all about napping. And Calvin is teaching Finley how fun it is to be hungry all the time and grow to be real big. And you guessed it--the post title is from the Babysitter's Club. Because that's what we've had the past 5 weeks, a club of babysitters. We are so blessed to have family and friends give up their time to watch Finley, and it was so good to get to spend some QT with the people we love. Thanks to Summer and Laura and Carrie for loving my boy, and thanks to Amy for coming back with sweet Calvin! I've alluded to the fact that my dog is insane at least twice (here and here) and I recently found some supporting evidence. I found this picture from BF (before Finley) when the only object of my camera's affection was crazy Copper. I mean really, if you saw him barrelling towards you, wouldn't you question his sanity for a minute? Did you get a good look at his eyes? So crazy. Currently, Copper is laying in the guest bed behind me (which I call his "throne" because it is where he perches all day long) CRYING. Copper David! Why are you crying? Why are you the biggest baby in the house? Why do you eat poop out of diapers and sometimes refuse to eat treats? It's because his life is SO HARD. So... Finley met his future wife on Saturday. 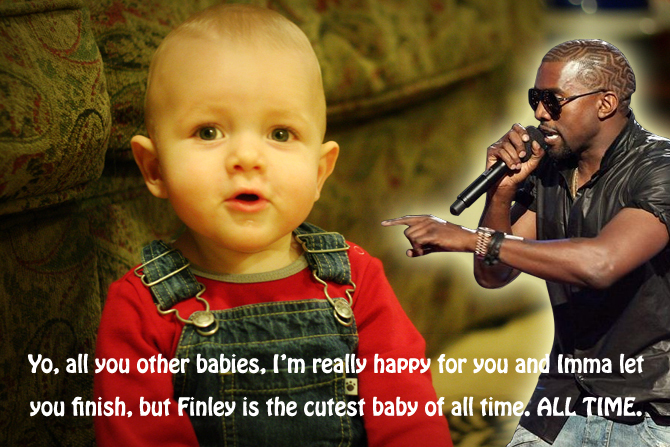 Finley can't stop talking about Olivia. Sure he hasn't quite gotten "Olivia" down but he sure is trying.... a lot of "nein, nein" and "dah, dah". Now, a couple of comments for all those naysayers out there that don't think a relationship between two babies can work. 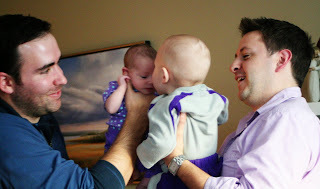 I don't have a lot of experience with baby couples, but these two seem to have what it takes. They communicate well (at least I think), share common interests (eating and pooping), they are both small, and like to wear shirts that are also pants (onesies). I had a sit down with the little guy and gave him the whole "Olivia is a lady and deserves a man with sincere intentions that will honor her" talk. I am pretty sure by the blank stare and drool meant he got it. Now, I know that Finley has quite a few choices as far as lady friends go but there are two reasons I know Olivia is the one for the ol' Finnster. 1) The last name thing. For those that don't know Olivia, she is the daughter of my very good friend Riley Scott and his wife Julia. It's pretty obvious what that means....yep Finley and Olivia Scott-Scott. 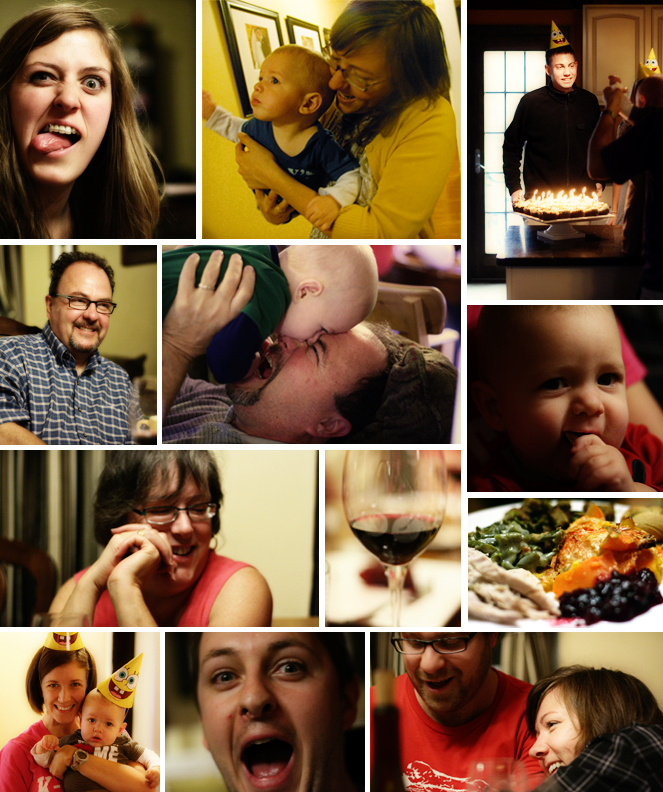 2) Awesome in-laws (at least mothers-in-law). Jury is out on the father-in-law, depends on how awesome the wedding is. P.S. Way to go Finley. Good to see you have an appreciation for good genes. Putting the "Sol" in "Sol and Rachel do a Blog"
In a few years, I will look back and laugh at what excitement I found in all of Finley's little changes. This week has brought two exciting changes and I'm not sure what to do about either of them. 1. Finley is a good little scooter. 2. He poops solid turds! I figured out how to get the video off of my camera and on to my computer, so here is my inaugural video. I decided to just post one of the two events... so here is a video of solid poop! Just kidding, it's him scooting. Now that Finley can move around, he is fascinated with pulling the curtains, power cords and the stuff under the coffee table. And my gross running shoes. And remote controls. It's time to make the house a little safer. 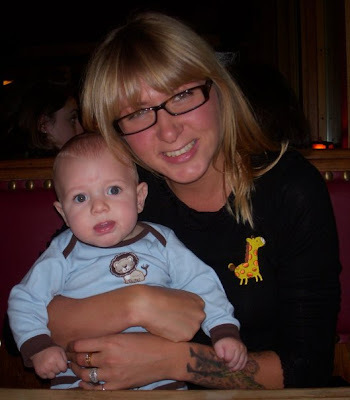 I'm not quite ready to have a mobile child--I want him to be my baby forever. But Sol wants Finley to be "King of All Babies" and ahead of the curve developmentally, so he gets a baby crawling workout everyday. 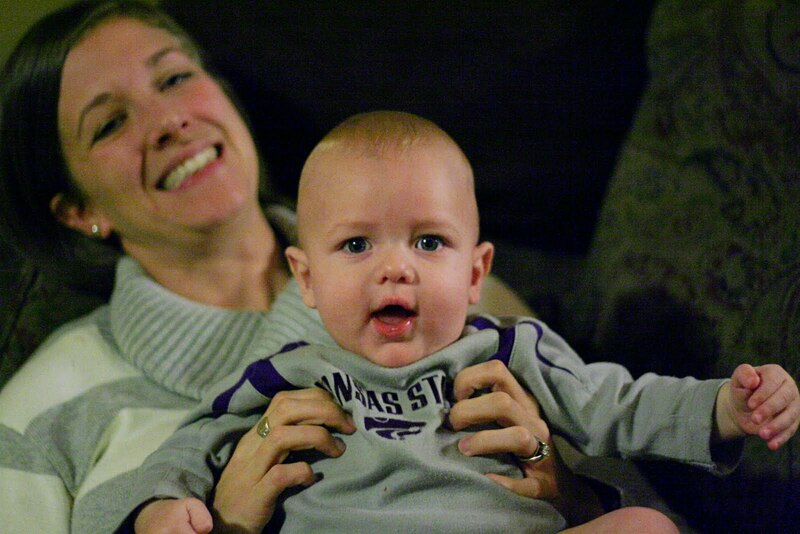 My sister, Laura, is watching him this week and her goal is to get him crawling and talking by the end of the week. She's doing well so far. And the poop--well that's courtesy of one mushed up banana and avocado. I love that I can recall every single food my child has ever eaten. Solid food is making cloth diapering a little different. The solid poop has to go in the toilet and our guest toilet... well... it doesn't accept large deposits. So we need a new commode. And a diaper sprayer. Poop is gross.